This week the Committee for Education, in partnership with the Assembly Education Service, launched a special interactive art initiative as part of a range of Committee activities to highlight Anti-Bullying Week 2016. MLAs and school groups visiting Parliament Buildings this week were asked to contribute to the artwork by cutting around a signed outline of their hand and attaching it to a canvas to quite literally ‘Lend a Hand’ to support Anti-Bullying Week 2016. Pupils from Maine Integrated Primary School were the first to lend their support, with Jamie Woodward (aged 8 yrs) and Freya Brady (aged 7 yrs) becoming the stars of the week as they helped the Committee Chairperson, Barry McElduff, and Deputy Chairperson, Chris Lyttle, to promote this important initiative. 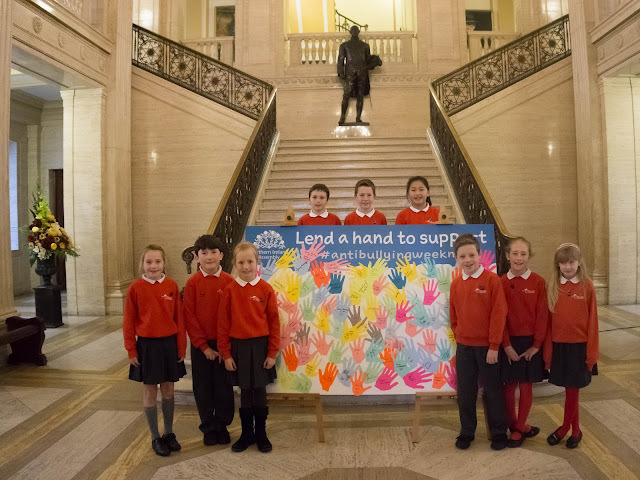 As the week went on, MLAs and visiting school groups came out in force, and the Great Hall in Parliament Buildings became a sea of colourful hands, with even the Minister of Education stopping by to offer his support. By Wednesday, we were almost running out of space (next year we’ll get two boards), but it was amazing to see so many of our students and MLAs come together to support this very important cause. final groups to 'Lend their hands' to the artwork. The Committee also visited Ashfield Boys' High School in Belfast this week, where they heard evidence from the Northern Ireland Anti-Bullying Forum and met with students who have been active in championing anti-bullying initiatives in their school. Pictured are (l-r) Sam Kelly, Year 14, Head Boy, Celine McStravick, Chair of Northern Ireland Anti-Bullying Forum (NIABF); Committee for Education Chair, Mr Barry McElduff; Rosanna Jack, Regional Co-ordinator, NIABF; and Rhys Jenkins, Year 9, Ashfield Boys’ High School Belfast. The Committee wrote individual pledges to highlight what they intend to do to help stop bullying. The Committee Chairperson, Barry McElduff, and Committee Member Rosemary Barton were also briefed on the ‘Stronger Together’ eBook, written and illustrated by students at St Ita’s Primary School in Carryduff. The P5 class devised the storyline through a series of workshops based on anti-bullying and emotional well-being and had many discussions on how they wanted the story to unfold and to be seen by children and young people all over Northern Ireland. All in all, a very busy and successful week. 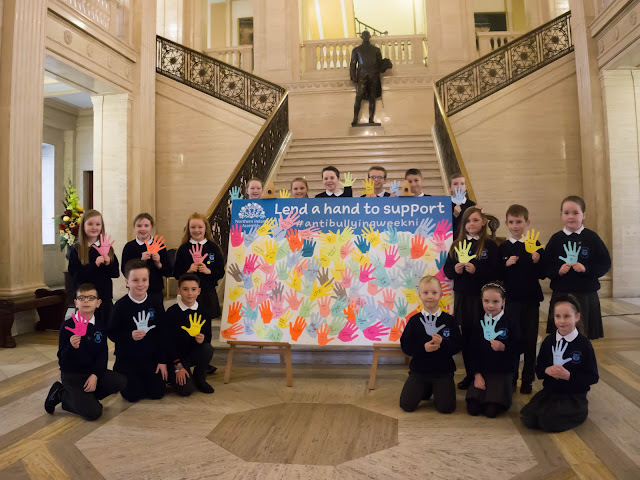 The Committee for Education and the Assembly Education Service would like to take this opportunity to thank all the MLAs and school groups who got involved this week.